I have recently been cleaning up and exploring an 8" Husqvarna Dux which has thrown up a couple of interesting factors.The re-assembly proved to be a little more involved than I expected, it seems that the side frames need to be quite accurately aligned both horizontally and vertically otherwise the cutting cylinder will not rotate freely. I had assumed that by just bolting on the bottom block and frame stay it would more or less work. There is little or no play with the bolts for the bottom block but clearly quite a lot of adjustment possible either end of the frame stay. It also appears that the cutting cylinder fits and works much better one way round rather than the other, although one might think that it made little difference. Having taken it all apart and put it back together several times I have concluded that the method is to bolt up the bottom block slightly less than finger tight, get the side frames parallel by eye, then adjust the inner frame stay bolts while spinning the cutting cylinder. The cylinder is then roughly equidistant between the side frames and rotating freely. Then tighten the bottom block getting the bottom blade parallel with the cutting cylinder before tightening the outer frame stay bolts. Now, have I missed a trick or is it really just down to a combination of trial and error and experience ? This large degree of adjustment on the frame stay is not something I have particularly noticed before on sidewheel mowers. 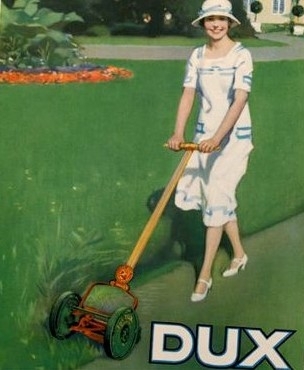 I'll have to check some other makes but it appears not to be so with Ransomes machines of the same period. I'm thinking that this must have been a consideration in the efficient mass production of The Dux. Also shows the rocking movement in the bottom block to achieve the correct set for the bottom blade. Noted stamped on all the blades is 24/25 which I take to be the date they were produced. This was unexpected as I understood the model to date from the 1930's. Surely they wouldn't have been hanging around for that length of time before being used. The wooden T handle has a metal collar and bolt, a feature which I thought more usually related to the post war era. I have however subsequently discovered that Husqvarna were producing mowers from 1918 when they acquired the firm of Norrahammers Bruk. I am currently in contact with Husqvarna hoping to get more of their mower history as there is very little on the internet. And a period advert, perhaps from the '30's ? A quick look in my bits came up with an Ad from Brisbane Courier Feb 1929, will dig a bit deeper when I get a minute. Thank you for your interest Clive. Noticing that the ad. comes from Brisbane I have a sneaking suspicion that it refers to a model made by Scott Bonnar. They also produced, amongst others, machines called The Standard and the Bon ! More like stone the crows! More like stone the crows! You mean you've gone to stripping the mower down to its parts, then re-assembling it with out restoring it. A little trick always mark any threads, so you can re assemble correctly, you normally find on the highwheel side wheelers, the frame has to be square. Lloyds have the same problem, the Lloyds Motomower has severe problems in this area. I think that it is good as it is. 'Preserved' rather than 'restored'. Each to his own. I agree, that “ as is” finish is just right for a machine of that type . Application of a modern paint job would look out of place and spoil it . I also agree with “ each to his own “ but if “ restoration” equates to restoring a machine to how it left the factory , possibly with a fairly utilitarian finish, the application of several coats of synthetic or two pack paint is out of place to say the least. Mower looks good as it is to me,nice job.A new roller would really set it off as it looks like the worms have been at the old one! hdtrusts observations once again raise the thorny subject of whether or not to restore or to what degree. As some members will have heard me say in the past I favour the idea of a machine looking it's age, which in this case appears as though it could be 90 plus years. The machine is complete, original and sound. with the possible exception of the rear roller which I will probably replace at some stage. It also works as it should; what more can one ask ? As it is not ' new and smart ' I have no qualms in loading/unloading/transporting it for events, no anxiety with scrapes and scratches. Over the years I have come across enthusiasts who have spent a great deal of time and trouble immaculately restoring a machine only then to more or less wrap it in cotton wool and store it away, hardly daring to breathe on it. The result is, yes, very impressive but........... Personally I prefer to actually use my machines as much as possible. The object of the exercise in taking it apart was to thoroughly clean it, find out more about it's workings and generally learn from the experience. The machine came to me in a very grubby, neglected state with little of the original colour visible. I'm quite pleased with the result and consider it time well spent. Oh dear! another can of worms, when to restore or not, and to what degree! Just remember we all belong to a greater movement, the vintage world which includes historians,collectors.speciaists as well as enthusiasts. Yes I agree its up to the owner, but in this instance the thought of stripping it down finding how it works, is one thing,I'm afraid oil is a poor excuse rubbed into the surface, if the method was that good perhaps the manufacturers would have done it in the first place! As for Wristpin's comment of 2 pack paint, that idea should be left to the likes of Wheeler Dealers and the Drew Pritchard brigade who only want to collect items that you can still get spares for on a shelf. Yes I to have reservations over the concurs sections with tractors and the like as it never was..